Original Okinawa handicrafts are in vogue, leading artisans to turn that interest into both a cultural and financial bonanza. Ryukyu traditional fabrics, pottery and lacquerware have been around for centuries, while the upstart local glassware made its debut little more than 100 years ago. Their popularity has seen periodic spurts when prominent figures--former Prime Minister Junichiro Koizumi, for example, began wearing distinctive shirts produced in the southern Yaeyama district—visit Okinawa in search of something different. 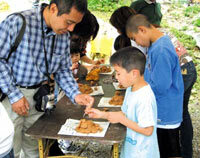 Throngs of the visitors to the Okinawa Handicrafts Fair a week ago saw firsthand the Okinawa creations, asking dozens of questions about the products’ background. Good questions, we thought, and set out to provide non-native Okinawans living here some comprehensive answers. Fabrics are well known and popular, and worn by countless visitors. How those fabrics are woven into Okinawa history is less well known. Ryukyu bingata is quite common, being transformed into clothing, kimono belts and decorative cloths at a number of factories in Naha, Ginowan, Urasoe and Itoman Cities, as well as in Tomigusuku-son and Tamagusuku-son. Bingata can be called typical Okinawan, with fabric designs or patterns created using dyes in processes first developed in the 15th century. 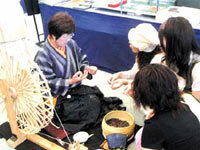 Katatsuke dying is done by dipping pattern pieces, while Noribiki dye process uses bright, vivid colors and indigo blue. Pigments and vegetable dyes are applied to cotton and silk, as well as to textiles hand woven from fibers of the Japanese banana plant. Indigo blue bingata, an intriguing color, is created through an immersion process, dunking the fabric into the dye. Nobody seems to know exactly how Yaeyama Minsa originated, but the popular five splash patterns alternated with four splash patterns signifying eternity have made a splash across Japan. The cotton yarns dyed with Indian or Ryukyu indigo plants and others are woven in a ribbed, lengthwise fashion, en route to creation of everything from shirts, belts, neckties, and business card holders, to eye-catching placemats and table runners. The Yaeyama Minsa products are made in the Taketomi-cho district of Ishigaki City. The Ryukyu dynasty’s old capital, Shuri, is home to its own series of fabrics, including its own splash patterned Kasuri, Hanaori, Douton-ori, Hanakura-ori and Minsa. The fabrics trace back to influences of China and other countries of southeast Asia. The Shuri-ori recreates sophisticated designs reminiscent of the Ryukyu dynasty’s old court, and is billed as one of the most elaborate craftsmanship anywhere. Craftsmen in Naha City, Nishihara-cho and Haebaru-cho crank out clothing and clothing material, as well as ornamental cloths and materials for kimono belts. The Miyako island group in Okinawa’s southern region is home to Miyako Jofu, a fabric woven with yarns from Ramie, a plant that first came into prominence in the late 16th century. Miyako Jofu fabrics are woven from Ramie plant threads peeled away one by one, then dyed indigo blue, before being hand woven in a process that hasn’t changed in hundreds of years. Clothing materials are produced in factories in Hirara City, Gusukube-cho, Shimoji-cho, Ueno-son, irabu-cho and Tarama-son. Most of these facilities have on site sales displays. Central Okinawa’s Yomitan Village area is home to Yomitanzan-Hanaori, a material once woven into fabrics exclusively for use of the inner court during the Ryukyu dynasty. Silk and cotton featuring geometric designs or patterns in colored filaments are common, but the material may also be found in checked, striped or splash patterns. Yomitanzan-Hanaori dates to the 15th century, but is made into clothing, kimono belts and centerpieces today in Yomitan-son. Yomitanzan-Minsa is also found in Yomitan Village. Minsa, which translates into ‘a narrow belt’, also dates to the 15th century, but has a more southern-Asia influence affecting the warp design patterns. Cotton is the predominant raw material in Yomitanzan-Minsa, which is used for kimono belts. Lacquerware, pottery and glassware are better known Okinawa products, and may be found everywhere , from department stores to souvenir shops to specialty stores and the factories themselves. Tsuboya pottery, the umbrella name for the Ryukyu Kingdom’s three different potteries—Chibana, Wakuta and Takara-guchi—got their start in the kilns situated in Tsuboya-yaki, a district of Naha City. Other primary factories today are in Onna-son and Yomitan-son. The Tsuboya-yaki potteries are predominantly lumped into two groups, Ara-yachi and Jo-yaachi. The two are very different, with Ara-yachi potteries often large, and always unglazed. Jo-yachi potteries are always glazed, and generally have Okinawa scenes painted on them before heading into the kilns for firing. Potteries are formed in everything from food and drink utensils to bottles, jars, pots and ornamental lion statues, or shi-sha’s. 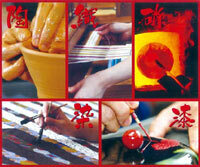 Distinctive, shiny and colorful, Ryukyu lacquerware is one of the island’s best known traditional handicrafts. Dating to the latter 14th century, lacquerware begins its production cycle using woods from trees or plants such as Diego, Egoni-ki, Japanese bead trees, Inumaki, Gajumaru and Japanese cedars. Diego, a flower bearing tree indigenous to Okinawa, is a mainstay. Natural lacquer is used to refine the lacquerware in the finishing process, with colorful, bright colors as the foundation before decorative gilded designs or brocades are added, as well as gold leaf, gold foil and shells. Highly sought-after Ryukyu lacquerware creations include trays, bowls, tea caddies and jewelry boxes. Factories, many of which offer tours and sales displays for visitors, are located in Naha, Urasoe, Itoman and Okinawa Cities, as well as in Nakagusuku-son, Tomigusuku-son and Haebaru-cho. The baby of the group, so to speak, is Okinawa’s Ryukyu glassware, which saw production only a century ago, and then mostly as lamp blobs and medicine bottles. The small industry picked up a life of its own following World War II, when glass souvenirs were made as souvenirs for visiting American military personnel. Today, the Ryukyu glassware made from used bottles, silica sand, limestone and alumina are common in food and beverage dishes and glasses, and also as vases. Factories are located in Naha, Itoman, Ginowan, Nago and Ishigaki Cities, as well as in Onna-son.